Last week, Bicycle NSW launched our campaign calling for safer heavy vehicle standards as a direct result of the serious injuries and deaths that had occurred to vulnerable road users. We know that truck drivers do not want to harm or kill people, and over the coming weeks we will be highlight companies who have already taken proactive safety measures. 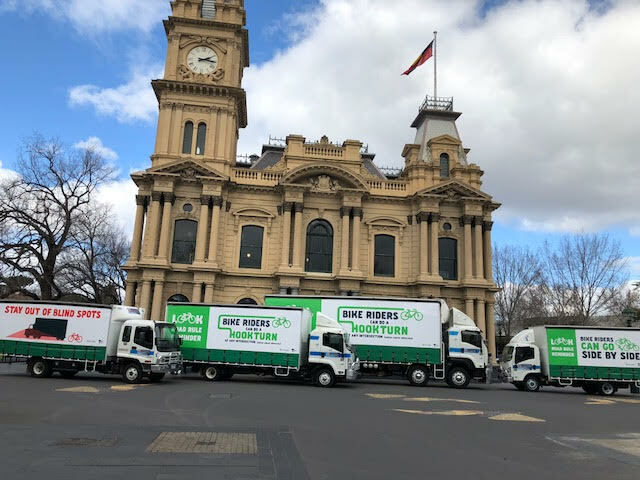 Meet Powers Country Express based in Bendigo, Victoria, who in 2018 ran a bike laws awareness campaign on their heavy vehicles. With the increasing number of bike riders around Bendigo, Powers Country Express wanted to help the whole community understand bike related laws but also increase awareness of truck blindspots. Along with the help of VicRoads and the Bendigo Cycling Classic, the Powers Country Express trucks received a makeover to clearly display road rules, useful to both people who ride bikes and those that drive motor vehicles. “Our staff are long term employees and we put an emphasis on being safe, responsible and not rushing while on the road,” said Damien Power, Director of Powers Country Express. They are currently working with the local council about raising awareness of issues between heavy vehicles and young drivers (16-25). “Bicycle NSW applauds the safety investments heavy vehicle companies make on behalf of their local communities and the areas they drive through. We look forward to learning about the work other companies are doing,” commented Kim Lavender, Bicycle NSW Communications Manager. If you are aware of a heavy vehicle operator investing in road safety, we’d love to share it. Bicycle NSW will continue in calling for better heavy vehicle safety standards, including side under-run protection and blind-spot sensors, to protect vulnerable road users.